Following directly on from the Bear Festival, residents of Prats-de-Mollo invite you to join them for a fun-filled day of carnival in the streets. 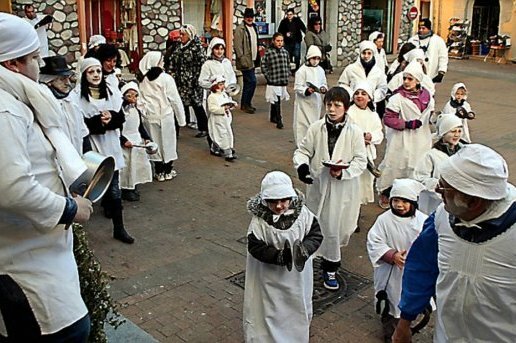 The children of the village dress up in white and cover their faces in flour, after which they parade through the streets making as much noise as possible, banging on pans and bin lids with anything that they can get their hands on! Exactly what it sounds like! Young and old, dressed in flamboyant and colourful costumes, join together to form a long line as they dance through the streets of the town, conga-like! The ‘posta’ is a plank of 1.5m long and 30cm wide carried by one person and accompanied by another, armed with a wooden sword. On one end is placed a picture of a pretty girl, representing the virgin, and on the other end, the devil. Dancers arrange themselves in couples opposite the carrier of la posta and move towards him 3 times. The first time they bow, the second time the lady must kiss the face on the posta, choosing devil or virgin, and the third time, she gets a smack on the bottom with the plank! In olden days, this dance was a judgement on vice and virtue!